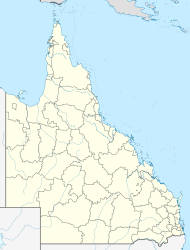 Rocksberg is a locality in the Moreton Bay Region, Queensland, Australia. In 2016 census, Rocksberg had a population of 300. The Caboolture River flows from north to east through the locality with Zillmans Crossing being a former ford (now a low-level bridge) across the river. The ford was part of the Old North Road (now superseded by the Bruce Highway) and was named after Leopold Zillman, an early pioneer farmer in the area. The river flats (elevation about 50 metres above sea level) are used for agriculture, mostly grazing, but the western side of the locality is undeveloped mountain land rising to numerous unnamed peaks, the highest being 350 metres above seal level. There is a picnic reserve near Zillmans Crossing. The locality takes its name from the property name used by the Zillman family. In the early 1840s, the Archer brothers of Durundur Station and Evan Mackenzie of Kilcoy Station blazed a trail to connect their farms with Brisbane, creating Old North Road (as it now known) as the first road north from Brisbane. Later it was supplanted by a road closer to the coast (now known as Old Gympie Road) and subsequently by the Bruce Highway even closer to the coast. Rocksberg Provisional School opened on 19 June 1893, becoming Rocksberg State School on 1 January 1909. It closed in 1954. In the 2011 census, Rocksberg recorded a population of 302 people, 49% female and 51% male. The median age of the Rocksberg population was 43 years, 6 years above the Australian median. 76.6% of people living in Rocksberg were born in Australia. The other top responses for country of birth were England 4.7%, New Zealand 2.7%, South Africa 2.3%, Indonesia 1%, Netherlands 1%. 88% of people spoke only English at home; the next most common languages were 1% Dutch, 1% German, 1% Indonesian, 0% Irish, 0% Gaelic (Scotland). ^ a b Australian Bureau of Statistics (27 June 2017). "Rocksberg (State Suburb)". 2016 Census QuickStats. Retrieved 19 March 2018. ^ a b "Rocksberg - locality in Moreton Bay Region (entry 45465)". Queensland Place Names. Queensland Government. Retrieved 30 December 2017. ^ "Zillmans Crossing - ford in City of Brisbane (entry 38852)". Queensland Place Names. Queensland Government. Retrieved 26 March 2018. ^ "Queensland Globe". State of Queensland. Archived from the original on 19 December 2017. Retrieved 26 March 2018. ^ a b "Caboolture River Road: a Journey Through Time" (PDF). Moreton Bay Regional Council. Archived (PDF) from the original on 13 March 2016. Retrieved 26 March 2018. This page was last edited on 17 February 2019, at 10:03 (UTC).